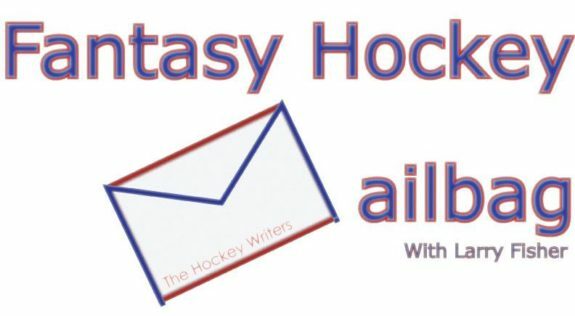 Saturday is typically the busiest day of the fantasy hockey week, so I felt it would also be the best day to introduce my newest column — Fantasy Hockey Mailbag. For those familiar with the “mailbag” concept, you are probably already putting two-and-two together. Essentially, I’ll be soliciting and answering questions pertaining to fantasy hockey from THW readers through social media and message boards as well as comments left on this website, which will be given precedence. Depending on the demand and popularity of this column, I’m planning to answer anywhere from three to five questions per week, likely publishing every Tuesday morning. I may respond sooner, giving brief answers to more timely questions as they come in throughout the week before elaborating in full detail when the mailbag comes out. I will also be incorporating my former Fantasy World column, which ran sporadically last season and ranged in content while providing insight into and highlights from my personal leagues. Those weekly updates can be beneficial to readers in terms of relatable experience and might generate a few laughs from time to time. As of today, I’m still in the same two keepers — a complex salary-cap league and a simpler dynasty league — and I’ll be joining at least one (family-run) box pool once the NHL season nears. If THW decides to launch a writers-only league, and if the draft date fits my schedule, I’ll try to get in on that too. I’ll do my best to make everybody feel a part of those leagues, to share in my successes and hardships, whatever the upcoming season has in store. The main focus will always be the mailbag, as a means of interacting with our readers and offering my two cents on their fantasy situations. Whether it is advice or feedback you’re asking for, I’ll be more than happy to answer. And, should you act on my answers, hopefully they’ll prove more help than hindrance in hindsight. I’ve been teasing the Fantasy Hockey Mailbag on Twitter for the past week and questions have already started to trickle in, but I’ll save those answers for the official debut — tentatively slated for Tuesday, Sept. 8. In the meantime, I’ll throw out some more examples of questions that could be of interest in the coming weeks and over the course of the season. If you ask them, I’ll do my best to answer. Do you recommend rotisserie or head-to-head leagues? What do you think of auction drafts? Are they the way to go? Who are some off-season trade targets for keeper leagues? Which players increased/decreased in value the most this off-season? Who are some sleeper picks for the upcoming season? Besides Connor McDavid and Jack Eichel, which rookies are worth picking? Would you make this trade, player X for player Y? Or, after the fact, what do you think of this trade I made? Which guy should I claim off waivers? Would you drop player X for player Y? OK, you get the drift. Now it’s your turn: You ask, I tell in my Fantasy Hockey Mailbag!